More news tonight from Lamborghini's big 50th anniversary shindig in Italy besides the insane Ecosta concept: the Lamborghini Urus SUV has apparently been confirmed for production. Exciting news for people everywhere with more money than taste. Evo magazine's Harry Metcalfe said on Twitter that the Urus will enter production in 2017. We knew this was probably coming, but now we have a concrete date. The folks at Car and Driver also recently said that the Urus is likely to be produced in the next few years, and as I reported a few months ago, Lamborghini CEO Stephan Winkelmann has been working hard to convince his Volkswagen overlords to green light the car. It makes sense. It may be delightfully silly, as Peter Orosz once put it, but you know it's going to perform well and sell like hot cakes. Obviously Lamborghini wants a repeat of what Porsche did with the Cayenne, whereby it became the bestselling car by a longshot and paid for them to keep making the insane, impractical sports cars we all love so much. More details when we get it, but it's safe to assume this will ride on the same platform as the next-gen Cayenne/Audi Q7/Volkswagen Touareg. If C&D is right, expect to pay between $150,000 and $200,000 for one. 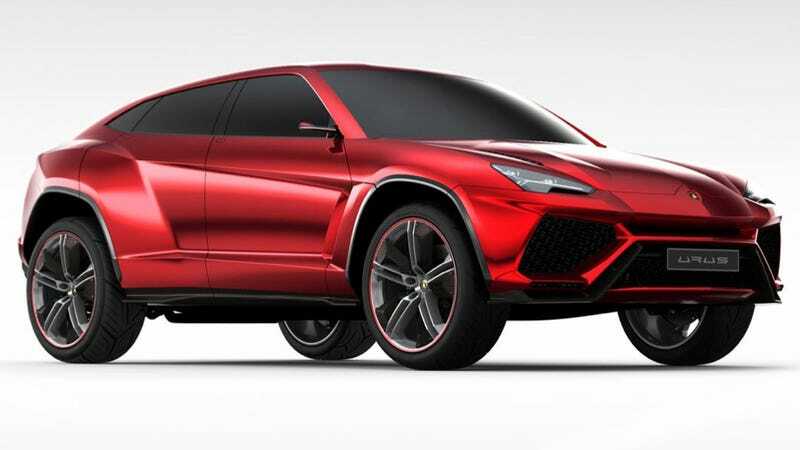 Who's down with a Lambo SUV? That isn't this thing, I mean.